A commanding and militarily vibrant biography of the peerless Prussian autocrat from one of Britain’s premier generals—and novelists. Fraser (Knight’s Cross, 1994, etc.) well appreciates that Frederick of Prussia wasn’t called “Great” for nothing: He had intellect and wit, was an adroit diplomat, tolerant, and kept an eye skinned for the interests of the common man (he wanted to be remembered as “King of the Beggars”). He was also perhaps a bit hasty, rash even, although that often served to benefit him as a brave and farsighted commander of his forces. 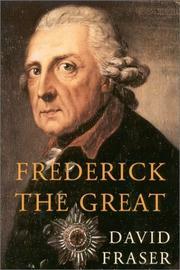 But Fraser ultimately admits that, for all of Frederick’s professed love of justice, there was the “conflict, never resolved, between his belief in the actual advantages of monarchical autocracy (in hands like his own) and his enduring belief—equally sincere—in the rights and dignity of man.” As the author makes plain, the buck stopped with Frederick on all matters (from the new opera house to the decision to invade Austria, again and again and again) and, although he was never one to avoid a confrontation, he was also an exemplar of realpolitik. Fraser turns his attention to all aspects of Frederick’s reign, and there is enough page space for him to dip into everything from court life and Frederick’s writings on political philosophy to his envy of Voltaire. This is a popular account, and if, at times, the writing feels like it is stuffed with feathers (“he introduced the young prince . . . to the possible delights of women”), it must be said that the author is never happier than when getting his teeth into one of Frederick’s frequent military battles—which receive extensive treatment.